The AK-47, undoubtedly the most iconic military small arm of all time. There has not been a conflict on the globe in the last half century which has not seen the likes of the Kalashnikov rifle, or more broadly, the 7.62X39mm cartridge. 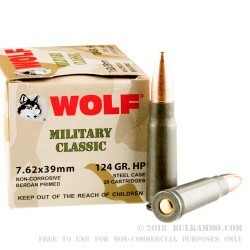 Wolf has long been the Pabst Blue Ribbon of ammo: it’s cheap to buy a lot of and it gets the job done. 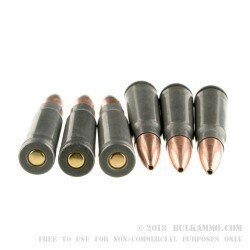 The 124 grain hollow point is a truly versatile round which will do very well in dispatching varmints and small predators, and can be coerced to take down an occasional Whitetail (the much smaller eastern variety; it would not be advisable on the monsters in the plains states). Kalashnikovs represent everything you’d want in a rugged truck gun, and the 7.62X39mm is experiencing a sort of renaissance as a ranch gun by prominent modern manufacturers, and it is no surprise why. 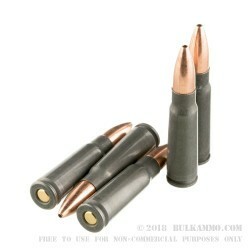 While not a tack-driving cartridge, the 7.62X39mm is hearty, reliable, and dirt cheap. You can find it anywhere from your local bait shop to the hot streets of Liberia, and everywhere in between. Thankfully you don’t need to meet up with Nicolas Cage to secure a shipment of Wolf 7.62X39mm hollow point ammo; just give us a call. Florida Tampa with bolt action sniper rifle fire close to 2000 ! A: Hello Mark, This ammunition is loaded with a lead core, bi-metal jacket projectile. Due to the steel content of the bi-metal jacket, this ammunition will not pass any type of magnet test.